Northern resident Orca Whales off the coast of Northern Vancouver Island in British Columbia. 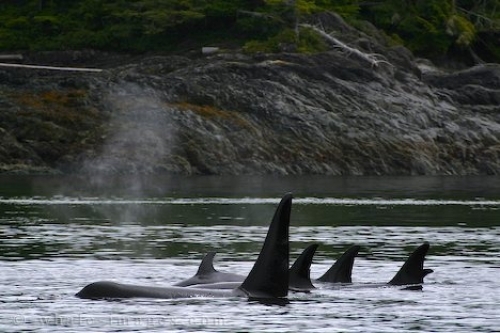 Northern Vancouver Island is one of the best spots when it comes down to Orca Whale watching. Several Touroperators offering whale watching tours into Johnstone Strait und Queen Charlotte Sound. This Killer Whale photo was taken on a whale watching tour in July, it shows a northern resident Orca Whale pod near Boat Bay on Cracroft Island. Picture of a Orca Whale family pod in Johnstone Strait near Boat Bay (Cracroft Island) off Vancouver Island, BC.